Environmental Protection Agency Administrator Scott Pruitt testifies before the House Energy and Commerce Committee on Capitol Hill on Dec. 7, 2017. The hits keep coming for EPA chief Scott Pruitt, with a new report from a government watchdog agency concluding that the Environmental Protection Agency broke the law when it spent more than $43,000 to build a soundproof privacy booth in Pruitt's office. The Government Accountability Office found that the EPA spent the money without providing advance notice to Congress, as required by law. The news is the latest negative headline for Pruitt, who has managed to hang on to his spot in the Trump administration, despite reports that some White House officials have pressed for him to be fired. Whether Pruitt stays or goes, though, the doubt surrounding his future could have an impact on the work carried out by the agency he oversees. Prolonged controversy and turmoil at the top of an agency can be a distraction for civil servants and political appointees who may worry that policies and procedures implemented now may be quickly swept away if new leadership is installed. "Unfortunately these sorts of rumors are often self-fulfilling as people begin questioning the authority of those who have important jobs to do," said Paul Winfree, a former deputy assistant for domestic policy at the Trump White House. Winfree is now at conservative think tank the Heritage Foundation. EPA is the latest agency to deal with questions about how long its chief official will remain in the Trump administration. The Trump administration has experienced a record amount of turnover in the past 14 months, but often there has been a gap between when reports of scandal or bad blood with the White House arise and when officials actually leave. The State Department and Department of Veterans Affairs both went through similar periods when it was unclear whether their leaders at the time — then-Secretary of State Rex Tillerson and then-VA Secretary David Shulkin — would be able to weather a barrage of bad press and calls for their removal. Both men were eventually pushed out. Allowing agency heads to remain in employment purgatory is often not helpful for federal employees looking for a sense of stability or clear direction from the White House. 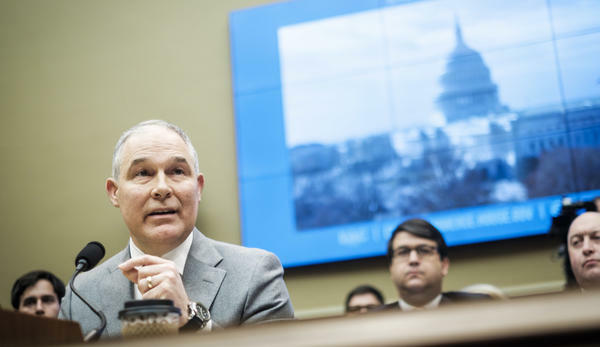 "Having Scott Pruitt under this huge cloud ... has really put much of EPA in limbo because people just aren't sure where to go," said Erik Olson, director of the Natural Resources Defense Council's health program. The NRDC has been a big critic of Pruitt's deregulatory push and has called for his ouster, but Olson said there is trepidation about who will succeed Pruitt. Pruitt's troubles go back to at least August when the EPA's inspector general office said it was investigating some of his travel back to his home state of Oklahoma. Since that time the alleged scandals have piled up, with reports about expensive chartered flights, pay raises doled out to aides without White House consent and a questionable stay at an apartment owned by the wife of an energy lobbyist. The uncertainty about Pruitt may be a "temporary distraction," but it will likely not ultimately stop the administration's policies from going forward, said Jeff Holmstead, who served as an assistant administrator at EPA under President George W. Bush. "All of the policy development and regulatory reforms are being carried out by folks who really share (Pruitt's) vision," said Holmstead, now an attorney for Bracewell law firm. Pruitt has denied any wrongdoing. In response to the GAO report on the privacy booth, EPA argued that it was not necessary to consult with Congress about the expenditure. The agency said in a letter to GAO that the booth was necessary to conduct official business and was not simply a redecorating project. Asked for comment on how the agency has been affected by Pruitt's tenuous status, EPA said Pruitt "is focused on advancing President Trump's agenda of regulatory certainty and environmental stewardship." Former Secretary of State Tillerson endured months of speculation about his future as secretary before he was let go in March. For months during his rocky tenure, it seemed like Tillerson and Trump were not on the same page, with Trump publicly contradicting Tillerson's policy positions on North Korea. The relationship between the president and Tillerson hit an especially low point in October, when Tillerson held a press conference about reports that he had called Trump a "moron," a charge Tillerson did not directly deny. The confusion about whether Trump still had confidence in Tillerson undoubtedly affected State Department staff, who had to contend with Tillerson's ambitious cost-cutting initiative, which now may not be carried out, said Heather Conley, of the Center for Strategic and International Studies. "You may not know who you're reporting to in a few days," said Conley, who was a deputy assistant secretary at State during the George W. Bush administration. "So, it just builds in distraction, and uncertainty and rumor mongering that just doesn't help people get their work done." Veterans Affairs: Who's in charge? Former VA Secretary Shulkin started out fairly popular with Trump, who pledged during his campaign to turn around the troubled agency that provides services for more than 9 million veterans. But the relationship between Shulkin and the White House soured after the release of an inspector general's report in February that accused Shulkin of inappropriately spending taxpayer funds during a trip to Europe and improperly accepting tickets to Wimbledon. After the report was released, White House officials sent mixed signals for more than a month about the president's support for Shulkin. Two days before Shulkin was fired, White House spokesman Hogan Gidley told Fox News that Trump still had confidence in Shulkin. While Shulkin was facing scrutiny, there were questions about who was actually representing views of the administration for veterans. "When that happens nothing gets done," said John Hoellwarth, a spokesman for AMVETS. "And veterans in particular can't wait around for things to just work themselves out like that, every day they're depending with their lives on a properly functioning VA."